Leslie Arthur Cox, a Journalist by occupation, enlisted into the Volunteers at Cape Town in 1894. During 1896-97 he served in Bechuanaland. In the published medal roll he is shown as a Corporal in the Mafeking Mounted Rifles but his medal is named to him as a Corporal in the Kimberley Regiment. 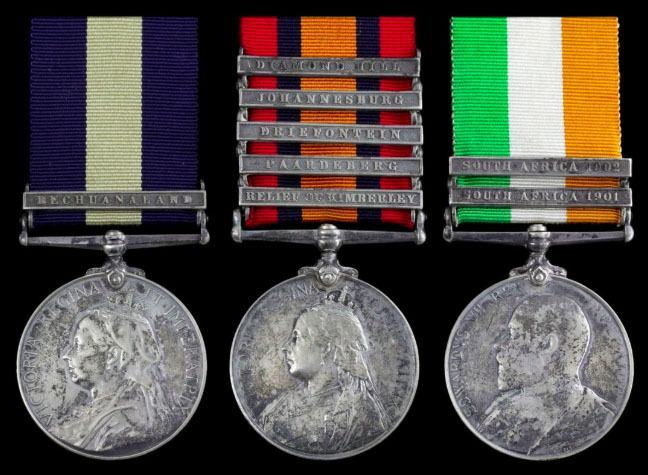 Next engaged in the Boer War, he served as an Orderly Room Sergeant in Kitchener’s Horse, for which he was awarded the Queen’s medal with three clasps, Relief of Kimberley, Paardeberg, Driefontein (not entitled to the Johannesburg or Diamond Hill clasps). The medal roll also shows service as a Lance-Sergeant in the Cape Town Highlanders for which he was entitled to the same three clasps. Continuing to serve in the Active Citizen Force, in the rank of Lieutenant (Temporary Major) in the Corps of Cyclists (Cape Peninsula), Cox was awarded the Colonial Auxiliary Force Long Service Medal; this was notified in the Government Gazette of 4 February 1916. Later, the Cape Peninsula Rifles became the 9th Infantry. Serving in the Great War as a Major in the Cape Cyclists, Cox was Mentioned in Despatches for the campaign in German South West Africa 1914-15. 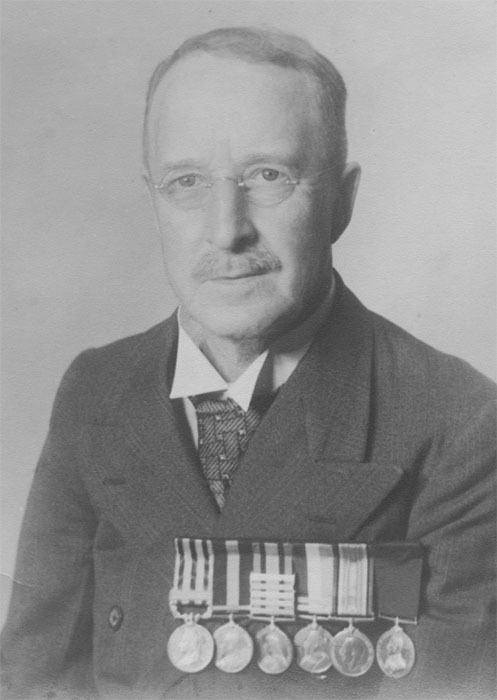 His medal record card states ‘Not eligible for the 1914-15 Star’, was not awarded the Victory Medal, and records show that the British War Medal was despatched in 1937. As a Lieutenant in the 9th Infantry, he was appointed a Temporary Captain on 1 December 1914, a Captain on 1 February 1915, a Temporary Major on 15 March 1915, and Major on 1 July 1915. He was released on demobilization on 25 January 1919. 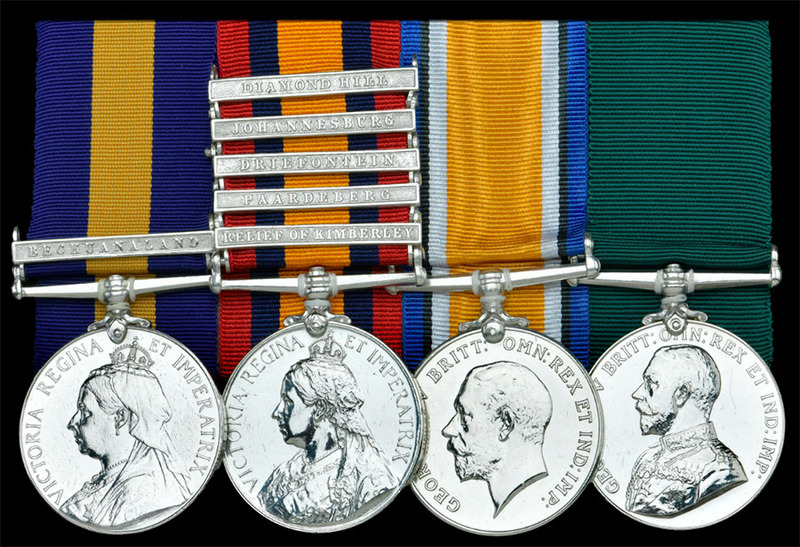 The recipient was not entitled to the last two clasps on the QSA, neither was he entitled to the two ‘extra’ medals featured in the photograph - the BSACM (1) and the KSA (2).